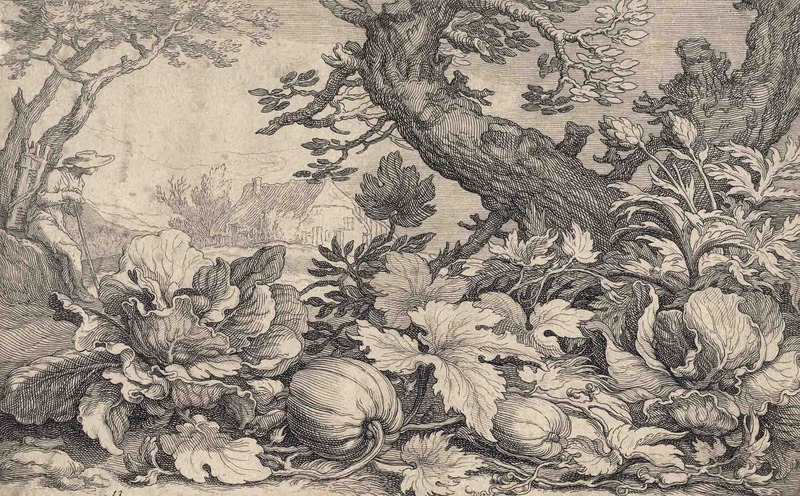 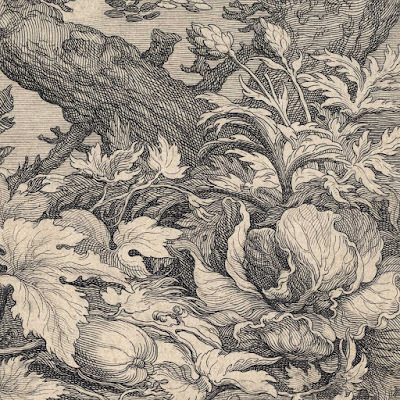 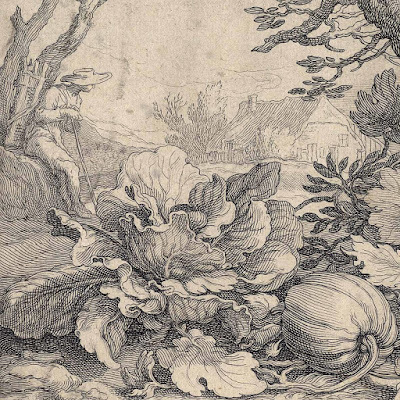 “Landscape with cabbages, artichokes and pumpkins under a large tree” (descriptive title only), 1613/14, after a drawing in the École des Beaux-Arts (Paris) by Abraham Bloemaert (1564–1651), plate 13 in the series of twenty plates, “Landscapes with Farmhouses”, published in the third state by Cornelis Danckerts I (1603–1656) in 1614, Amsterdam (see the title sheet for the series at the BM: http://www.britishmuseum.org/research/collection_online/collection_object_details.aspx?objectId=3058282&partId=1&searchText=1986%2c0510.4.&page=1). Engraving with etching on laid paper trimmed with thread margins around the image borderline and backed with a support sheet. 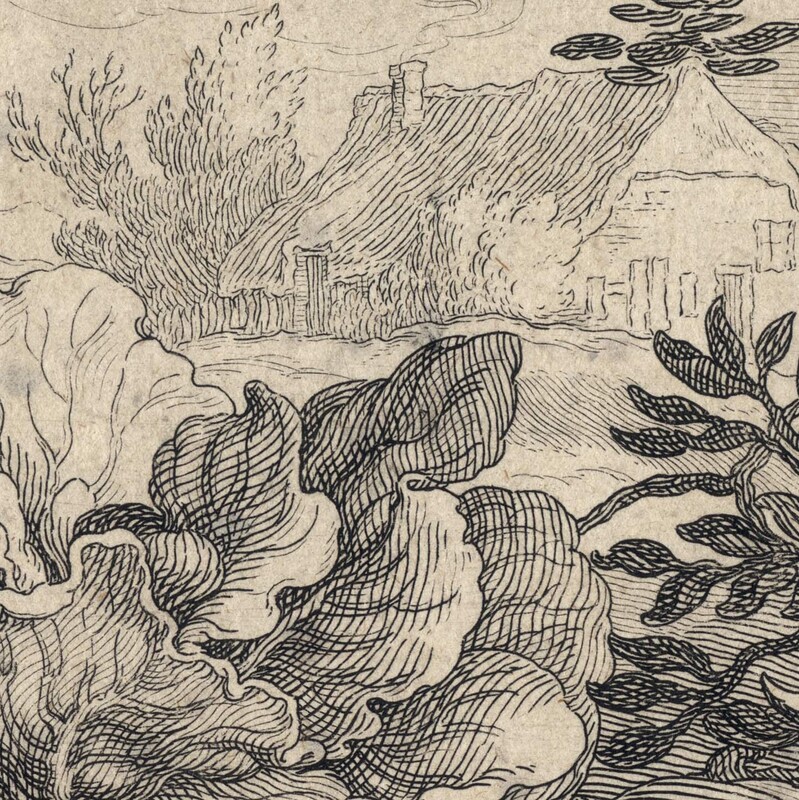 Numbered on plate in lower left corner: "13". 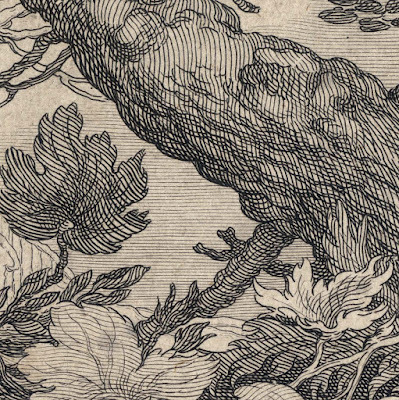 Condition: well-inked and well-printed impression trimmed with thread margins around the image borderline and laid upon a support sheet. The sheet has an area of replenished loss at the upper left corner and the tips of the lower corners may also be restored (I am not certain about this) and there are a few light surface marks (e.g. 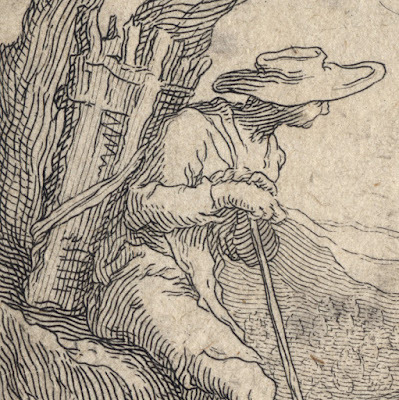 the trace of a mark in front of the seated figure at left); otherwise the sheet is in good condition. I am selling this lush image of vegetable bounty by one of the most important 16–17th century printmakers for AU$326 (currently US$241.62/EUR207.36/GBP181.86 at the time of posting this print) including postage and handling to anywhere in the world (but not, of course, any import duties/taxes imposed by some countries). 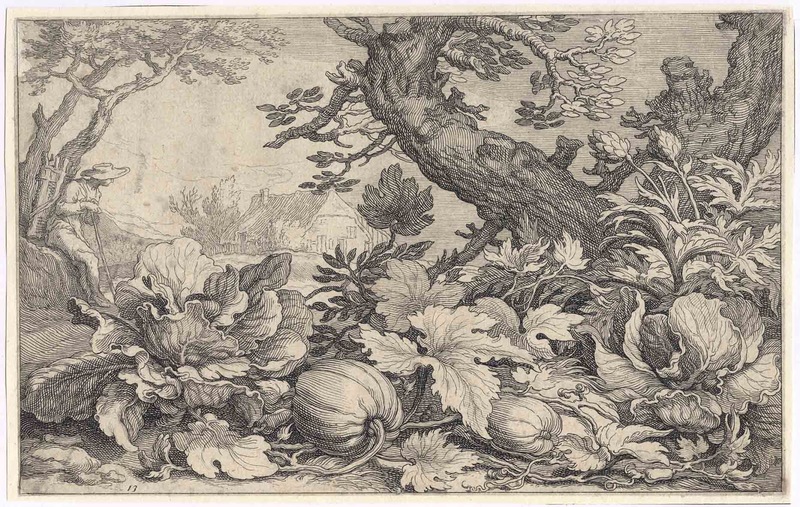 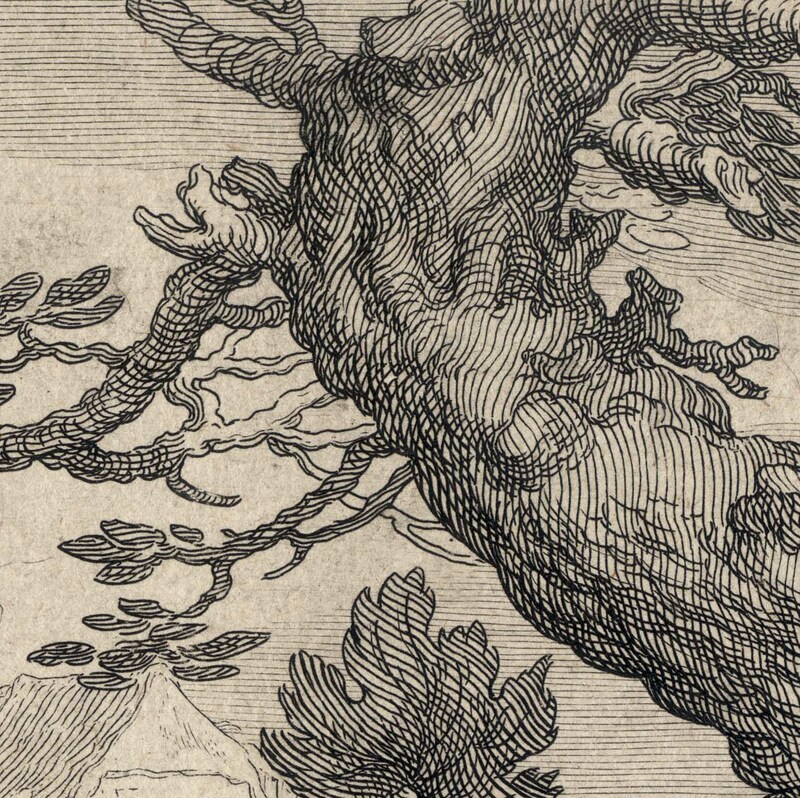 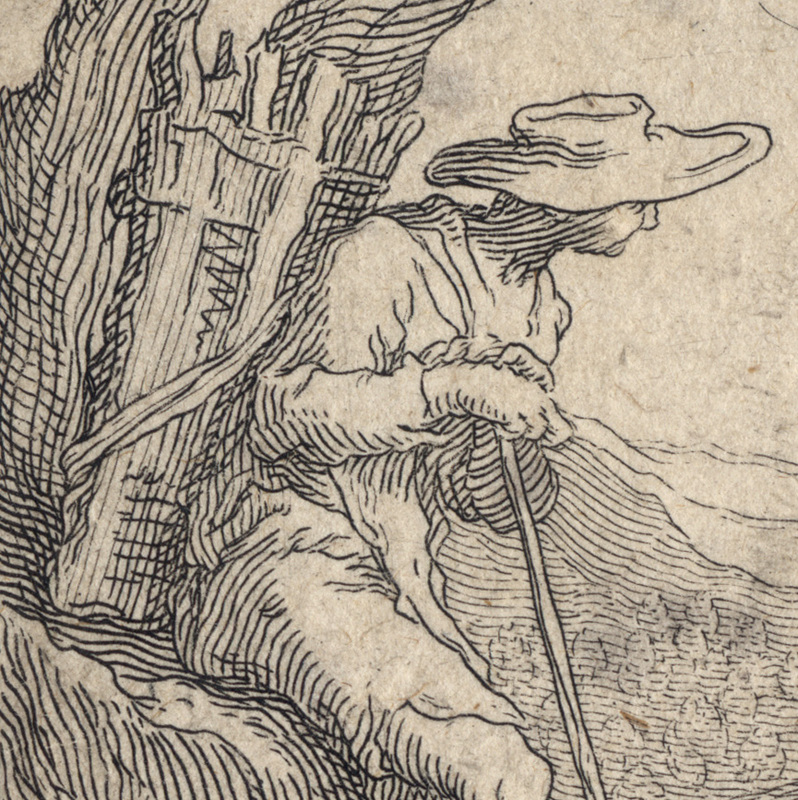 If you are interested in purchasing spectacular engraving exemplifying not only the leaning to Mannerism of the time but also the spirit of realism of the Dutch Golden Age, please contact me (oz_jim@printsandprinciples.com) and I will send you a PayPal invoice to make the payment easy. 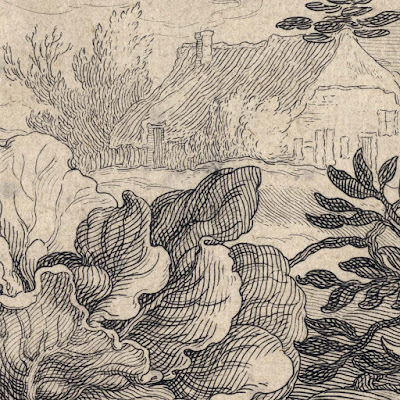 This lush vegetable patch is extraordinary. 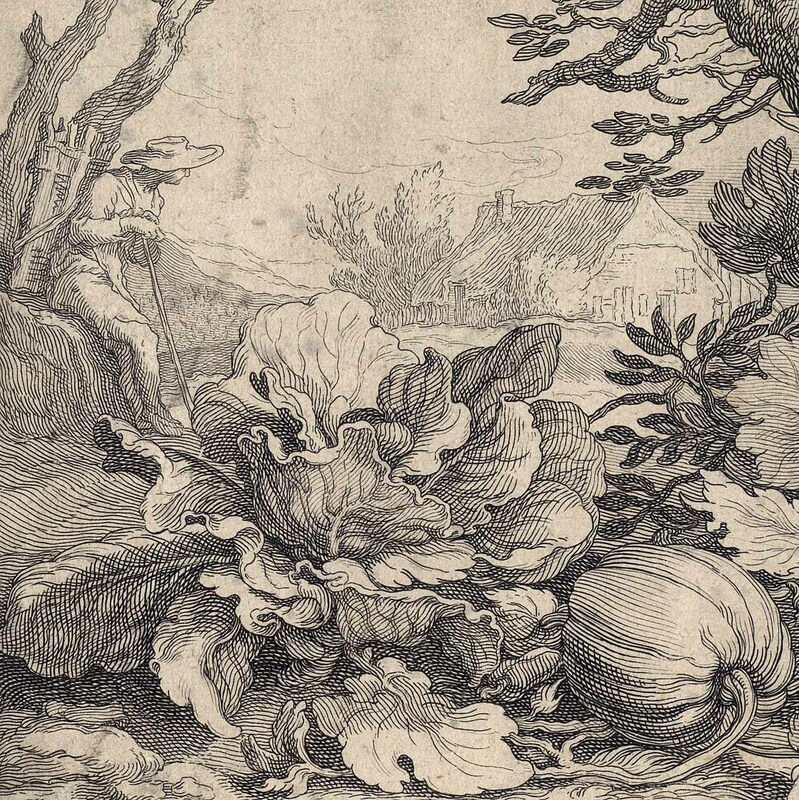 From my experience of gently guiding my cook into the garden to dig, plant, fertilize and water an assortment of seeds to make similar vegetable patches, I now have low expectations of ever seeing such award winning vegetables … and certainly not ones magically grown in the shadow of a gnarly tree.